“I can’t think of a single time that an individual or an organization has created a brand-new worldview, spread it and then led that tribe. In my mind, “the hunger that needs satisfying” in the meat goat industry, is performance tested genetics. The “early adopters” were the progressive producers in the dairy, beef, swine and poultry industries that embraced on-farm performance testing. This process; when widespread, like the DHIA system in the dairy industry, paved the way for the calculation of Estimated Progeny Difference (EPD) and Estimated Breeding Value (EBV) calculations. The meat goat industry needs to be made aware of this step by step process. The first step is detailed herd management recording. Births, deaths, breeding records, sales information, pedigrees and herd health information all needs to be collected in order for producers to take their place in the “food industry”. Modern consumers are demanding “traceability” and “transparency” from producers who want to service their interest in “fresh and local” foods. They will pay more, only if they are satisfied with your attention to the health and welfare of your livestock. You have to “prove” you are the “real thing”. “Authenticity” as a food producer may mean close scrutiny of both your operation and the recording system that supports your “claims of quality”. If you are only interested in shows and blue ribbons, you have not really embraced the “meat goat industry”. The objective of meat goat production is a consumable product, not a family week end experience. The second step is on-farm performance evaluation. If you aspire to breeding excellence in the meat goat industry you are profit motivated and you understand that your does are profit centres. You understand that phenotypic evaluation through a show ring rarely correlates to maternal productive efficiency: the cornerstone of operational profitability. If you are looking for a herd sire you would like to have some records to be able to evaluate his transmitting ability. When you look around at the current cadre of “breeders” you recognize that they have embraced artificial Insemination and embryo transplant technology before they embraced an objective system that identifies production superiority. They have depended on a “judges eye” rather than the scientific method: a weigh scale and recorded data. It is amazing to me that we are more than twenty years into the development of our meat goat “business” and we still do not have widespread recognition that we need an industry wide system that objectively identifies superior animals. How do we hope to compete in the modern food industry? How do we hope to be taken seriously by government when we are pursuing blue ribbons instead of production data. This situation is ridiculous. It has come as a result of the incredible speculative interest that pushed the Boer goat into North America’s spotlight as “the most improved meat goat in the world”. We took this as “a given”. Then, when the speculators left and commercial folks had to make a living with their goats; Boer goats started to be questioned as the best breed for efficient, profitable, larger scale production. I am confident that a new breed of meat goat entrepreneur is wanting something more than show records to convince them of an animal’s “genetic merit”. Dr. Ken Andries was also in attendance as an AGF director and few would dispute his industry leadership in developing the Kentucky State University’s Goat Herd Improvement Program (GHIP). This is a free, on-farm, herd performance recording program and it is already up and running. Only you will know how your animals compare to one another. As Jean Harrison describes it, “you can’t manage what you don’t measure”. If you are looking for a “structure” to advance the industry, I would say that Reno identified three important pillars to that structure. 1) Basic herd recording to improve management decision making. 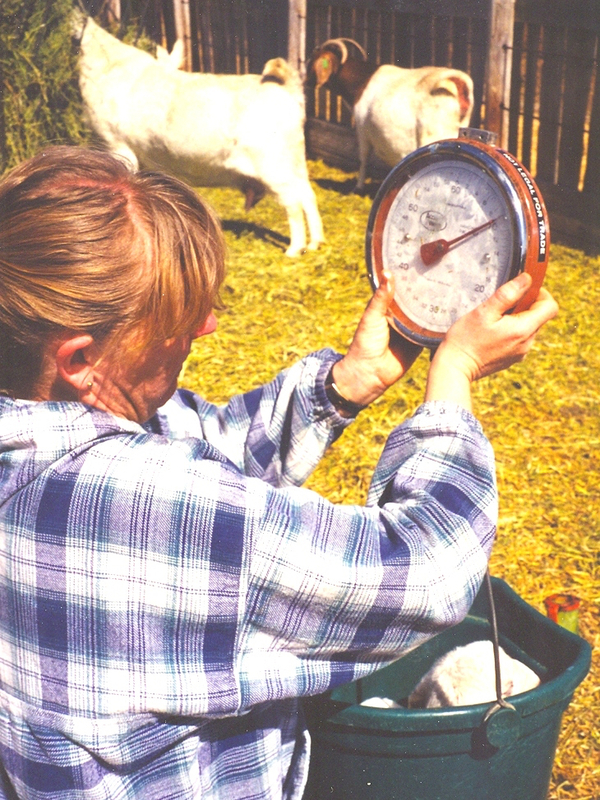 2) On farm performance testing to identify the keepers and culls in your operation. 3) Industry wide co-operation to put in place a system like the National Sheep Improvement Program (NSIP) which can help us better predict the breeding merit of our animals. We can’t get to this final step unless we gather the “disconnected” and join together behind performance data collection. If your goal is a profitable meat goat operation let us know if you want to belong to our “tribe”. Contact the writer (Brian Payne, savannahassociation@yahoo.ca), Jean Harrison, Dr. Ken Andries or Anita Dahnke and the American Goat Federation to get “connected” (contact Anita Teel Dahnke, anita@americangoatfederation.org).